Door Hangers provide all the advantages of postcards without the mailing cost. Recruit a crew to help you distribute your door hangers to save time and money, and reward them with a pizza afterwards. 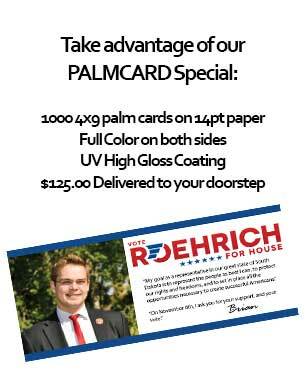 Or, even better, it’s also a great way to reach out and touch people who you missed while campaigning door to door. Leave them a door hanger, and add a post-it letting them you know you were sorry to have missed them. 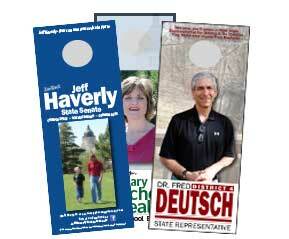 Dakota Campaign Store Door Hangers also outshine the competition in material quality. Cheap door hangers blow off in the wind, or are confounded by the modern flipper door handles on many homes. Our Door Hangers are printed on heavy 14pt or 16pt stock, allowing you to curl them up behind flipper knobs – and they will stay put.